Hoping to secure a fourth term in Government, “A Future Fair for All” focused on rebuilding the economy, renewing society and restoring faith in politics. Prime Minister Gordon Brown promised to give voters a greater voice in public services and allow the takeover of underperforming schools, hospitals and police forces. 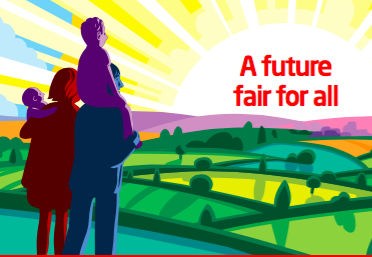 The manifesto contains “50 steps to a future fair for all”. These steps include a “Toddler Tax Credit” that promises £4 a week extra for families earning under £50,000 with one and two year olds. On the economy, they pledge to secure the recovery by supporting the economy and halving the deficit by 2014 through growth, fair taxes and cuts to lower priority spending. Other key points include creating up to 70,000 advanced apprenticeships a year and Skills Accounts for workers to upgrade their skills. The right to recall MP’s, a referendum on the alternative role for the Commons and a free vote in Parliament on reducing the voting age to 16 is also in the manifesto. Charities welcomed the party’s plans for a National Care Service to ensure free care in the home for those with the greatest care needs, and capping the costs of residential care. Losing more than 80 seats, 6th May was certainly a bad night for the Labour Party. The 2010 General Election produced a Hung Parliament between the Conservatives and the Liberal Democrats. On 10 May, Gordon Brown resigned as Leader of the Labour Party and triggered a Leadership Election, which resulted in the election of Ed Milliband on 25 Septmeber.